Ed Sheeran has hit back after he was dubbed "boring" by the organiser of the Isle of Wight Festival - revealing that he had actually been asked to play at the event in 2015 but had turned the invite down. 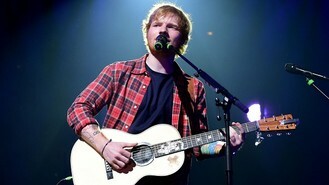 The 23-year-old singer, whose album X has sold more than 634,000 copies in the UK since its release in June, revealed he had been on the festival's wish list for next year, after promoter John Giddings told the Live UK Summit panel: "If boring acts like Ed Sheeran are the future, then we're all s****ed." The Sing star tweeted: "H e asked me to do the festival next year a few weeks ago, funnily enough, and I couldn't do it due to another gig." John replied: "haha !! fair play.....@Gigwise @edsheeran." The promoter has since laughed off the comments he made at the event, claiming they were "tongue-in-cheek". John had said: "We're not building headliners any more. Nobody can invest in building a band over five albums. And if boring acts like Ed Sheeran are the future then we're all s****ed." Both of Ed's albums, + and X, have reached number one in the UK album charts. The A Team musician, who has won Brit awards and has been nominated for a Grammy, recently played four sold-out gigs at London's O2 Arena.